Airship Cannons...Fire! (or World 2-4) is the fourth and final level of World 2 and the eighth level overall in Super Mario Run. The level starts at a dropoff to an airship with Cannons and Ninjis. After the second Ninji, the first Pink Coin can be seen, although the player needs to jump on the Cannonballs to reach it. Many more Ninjis and Cannons appear, as well as the second Pink Coin, in which the player needs to jump off of a Ninji to collect. After jumping onto another airship with a single Ninji, the next airship contains the third Pink Coin, although the player must jump over a Ninji to collect it. After two more jumps, the player will approach pairs of Cannons, along with the fourth Pink Coin, in which the player must jump over two Ninjis to obtain it. After passing a row of ? Blocks, the player will reach the fifth and final Pink Coin floating just over a bottomless pit, in which they must bounce off of a Ninji in order to reach it. After more pairs of Cannons and more Ninjis, the boss warp pipe is finally reached. The level starts at a dropoff to an airship with Cannons and Ninjis. After the second Ninji, the first Purple Coin can be seen, although the player needs to carefully jump on the Cannonballs to reach it. Many more Ninjis and Cannons appear, as well as the second Purple Coin, in which the player needs to jump off of a Cannonball to collect. After jumping onto another airship with a single Ninji and then jumping onto a higher level of airships, the airship after the next contains the third Purple Coin, although the player must jump over a Ninji to collect it. After two more jumps, the player will approach pairs of Cannons, along with the fourth Purple Coin, in which the player must jump over two Cannons to obtain it. After passing a row of ? Blocks, the player will reach the fifth and final Purple Coin, in which they must cross the pit and bounce off of a Cannonball in order to reach it. After more pairs of Cannons and more Ninjis, the boss warp pipe is finally reached. The level starts at a dropoff to an airship with Cannons and Ninjis. Immediately, the first Black Coin can be seen, although the player must jump on the Ninji on the first row of ? Blocks to take it. Many more Ninjis and Cannons appear, and if the player jumps off a Cannonball to make it to a higher level, they will approach the second Black Coin. After jumping onto another group of airships with ? 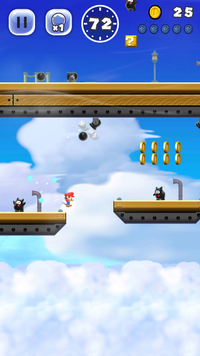 Blocks, the next airship contains the third Black Coin, although the player must slide off the nearby ledge and then quickly wall jump over a Ninji to collect it. After two more jumps, the player will approach pairs of Cannons, and at the end of the segment, they will reach the fourth Black Coin, in which the player needs to jump onto the ? Block with a Ninji on it, then jump again to collect the coin. After passing more Cannons, there is a rightwards-facing Cannon with a Ninji on it; the player must bounce off of one of the Cannonballs coming from that particular Cannon to reach the fifth and final Black Coin. After crossing more Ninjis, the boss warp pipe is finally reached. Taihō Banban! Cannons Bang Bang! French Chargez les canons... FEU ! Load the Cannons... FIRE! Italian Fuoco alle polveri! Powder fire! Daepoga pungpung! Cannons Bang Bang! Dàpào pēngpēng! Cannons Bang Bang! This page was last edited on March 12, 2018, at 01:04.